Vitamin B7 (Biotin) is a water soluble vitamin necessary for cell growth. Serum is extracted using the EVOLUTE® EXPRESS ABN 96-well plate. The application note provides details of the sample preparation procedure, together with UHPLC and mass spectrometry conditions. Good retention and chromatographic peak shape was obtained using the C18-PFP column. Stripped serum was spiked at various concentrations from 25–5000 pg/mL for recovery determination. High reproducible recoveries > 80% with corresponding RSDs < 10% were demonstrated. Post extraction residual phospholipid levels were investigated to provide an indication of extract cleanliness. The most abundant phospholipids in human serum (previously selected from full scan, SIR and precursor ion scanning experiments) were assessed using MRM transitions monitoring the common 184 product ion. Extract cleanliness was also investigated using post-column infusion (PCI) experiments. 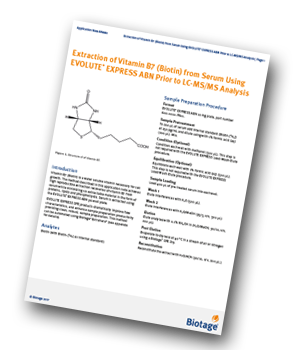 Mobile phase and blank serum extracts were injected onto the LC-MS/MS setup while simultaneously infusing Vitamin B7, to determine regions of suppression.